Warm weather grasses include a variety of species that originated in tropical areas. Unlike their cool season counterparts, warm season grasses love the heat. Their peak growing time is mid-summer when the temperatures are the hottest. Those warm-season grasses that are considered drought-tolerant (which includes most, but not all, warm-season species have the ability not only tolerate heat, but they also can survive on very little water during peak growing times. Here are some good warm-season grasses known to be drought-tolerant, as well. Bermuda grass loves full sun and has excellent traffic tolerance. It responds quickly to watering after drought and requires frequent mowing. Bermuda grass tends to go dormant during the winter and is often overseeded with ryegrass in the winter to ensure that the green color is maintained. Varieties considered drought tolerant include: Common Bermuda, Celebration, GN1, Grimes EXP, TexTurf, TifSport and Tifway 419. St Augustine is a medium green, coarse-leaf grass that prefers dappled shade and is acceptable for moderate traffic. It remains green for the winter months of dormancy but is susceptible to diseases if it's excessively watered during the winter. Floratam is considered the best drought-resistant variety. 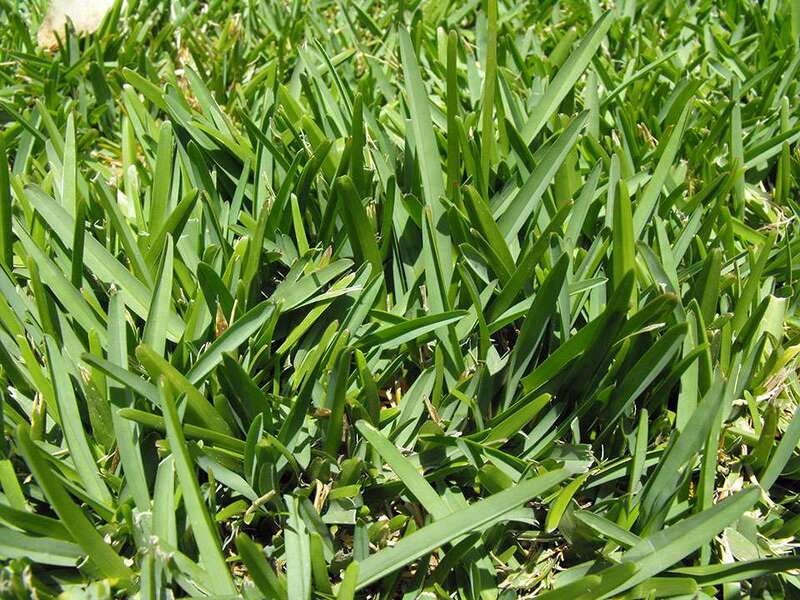 It is the most shade-tolerant warm-season turfgrass. Zoysia tolerates sun and shade but is slow growing compared to Bermuda and St. Augustine, but once Zoysia is established, it provides a lush, green carpet of turf. Zoysia tolerates foot traffic well and different varieties have varying tolerance to drought. El Toro, Empire, Jamur, and Palisades are considered drought-resistant varieties of Zoysia grass. Buffalograss is unusual in that it is native to the Midwest rather than tropical regions. It requires full sun and does not tolerate much traffic. It requires little, if any, water once it is established, but it must be established from plugs and must be mowed high (over 5" or not at all). All varieties of Buffalo grass are considered drought tolerant, but some newer varieties, such as Legacy, are favored over others. Centipedegrass is apple-green or lime-green in color, and although it is slow growing it makes an attractive, low-maintenance lawn once established. It prefers full sun or partial shade and tolerates acidic soil, so it is commonly used in the dappled shade under pine trees. Bahiagrass is a good all-purpose grass with excellent wear tolerance, disease- and insect-resistance, and it grows well in infertile soils. It is considered drought tolerant because of its prolific rooting, but it can thin out over time and is not suitable for shady areas. As with any plant, drought tolerance can be increased by providing ideal growing conditions and cultural practices. Deep infrequent watering, healthy soil and mowing at a species-appropriate height can increase the drought tolerance of any plant, including lawn grass.